In these dwindling December days filled with endless parties full of punch bowls laden with egg nog, bacon wrapped scallops on fancy trays, and entire tables devoted to artistic cheese displays, I thought you might appreciate something a bit lighter to ingest between Fêtes. This one simple soup may be the thing we all need right now to get us zipped into another tiny black clingy dress – right? Or, maybe you shelve this one for now and revive it in the New Year to help un-do all the merry making. Either way this Charred Broccoli Soup is a winner, I am not even going to mention the fact that it is mostly vegetables and therefore: good for you, very filling, and low calorie too! In a large pot heat 3 Tbsp olive oil, add the onion and garlic and season with salt and pepper. Cook over moderate heat, stirring occasionally until softened and just starting to brown 6-8 mins. Add 2 cups water and the stock, potato, broccoli stems and two-thirds of the florets. Bring to a boil over high heat, then lower the temperature and simmer stirring occasionally until the potato and broccoli are very soft, about 30 minutes. Meanwhile on one side of a large rimmed baking sheet toss the remaining broccoli florets with 1 Tbsp of oil and season with salt and pepper. In a medium bowl toss the bread with the last Tbsp of olive oil season with salt and pepper, you could add some dry herbs as well such as thyme or rosemary. Spread the bread on the other half of the baking sheet and bake altogether for about 10 minutes. Check to make sure the bread does not burn, the florets are a lot more forgiving. Now working in batches puree the soup in a blender or food processor until smooth. Stir in the vinegar and taste to see if more salt or pepper is needed. 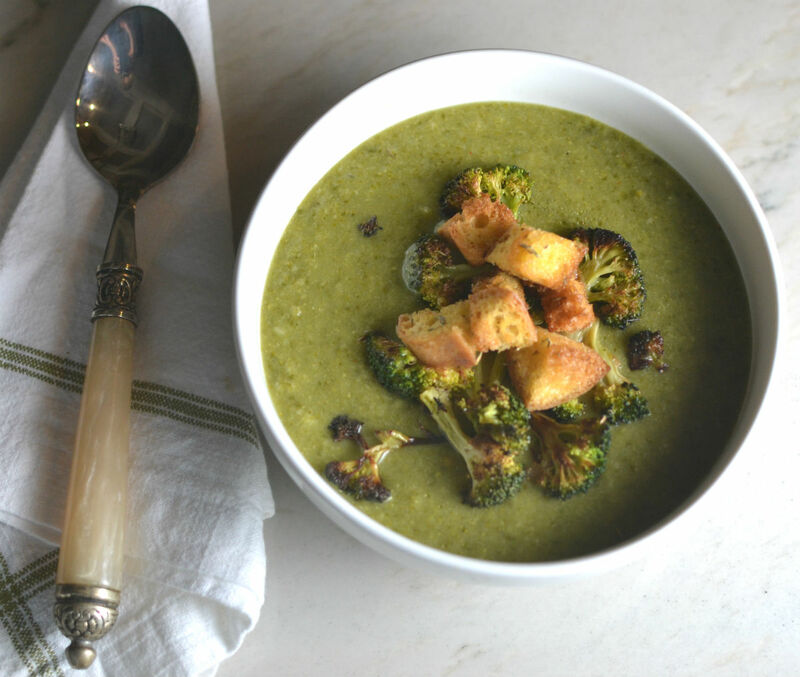 Ladle into warmed soup bowls and garnish with crispy broccoli florets, croutons and chives. This sounds great! Soups are so wonderful this time of year. I will try this one…love all the green vegetables! Perfect timing! I can’t zip up my party clothes – making this soup today. I’m just going to give this a try for my Christmas guests. I’m going to give this a try for my Christmas house guests.